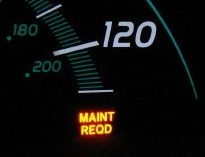 Every 5,000 miles an oil change indicator light that reads, "MAINT REQD" is automatically switched on in most vehicles. 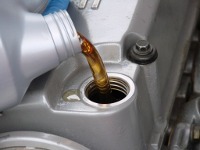 If you change your own oil, or go to a quick lube shop, you will have to switch off the oil indicator light yourself. Below is a very simple four step process that should turn off the MAINT REQD light for a majority of vehicles (and possibly other brands as well). Press and hold the trip meter reset nob (next to your odometer). While holding the trip meter reset nob, turn the ignition to 'ON', but do not start the car. If the light is still lit, you can try disconnecting your car battery, causing the internal computer to reset. If you still haven't successfully turned off the oil indicator MAINT REQD light, please read your manual or contact your dealer for further instruction!